The competitive landscape of the global digital signage market is marked by intense rivalry among the top players, finds Transparency Market Research. Top players consider it worthwhile to adopt a combination of strategies to stay ahead of others. . In particular, several players are making sizeable investments in research and development activities, with an aim to developing innovative products. This is also a potentially significant factor that has lowered the entry of small vendors. Nonetheless, relatively small players are making geographic expansions to put a stiff competition to large ones. TMR notes that in the years to come, technological advancements in the market from across all quarters are expected to raise the ante for incumbent players. Prominent players operating in the global digital signage market include NEC Corp., Panasonic Corp., Advantec Co. Ltd., Cisco Systems Inc., and Omnivex Corp. 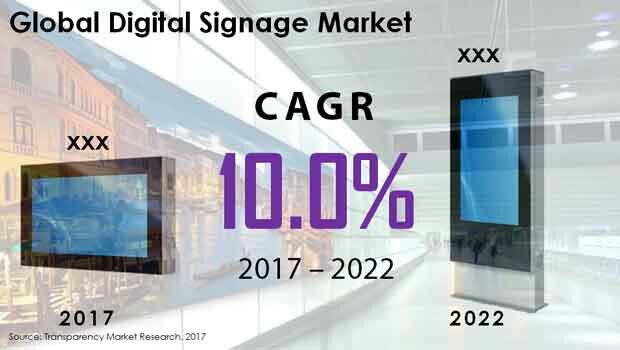 The global digital signage market stood at US$ 21.50 bn in 2017 and is projected to proliferate at a stellar CAGR of 10.0% during 2017–2022. With substantial growth rate year-over-year, the opportunities in the global market will touch a valuation of US$ 34.67 bn by the end of 2022. On geographical front, North America market for digital signage is dominating the global digital signage market and the region will continue its dominance with the CAGR of 11.10%. The retail sector is dominating the global digital signage market as it attracts more customers and saves printing cost. Additionally, the demand for digitized display in the retail industry is increasing at a considerable pace in these regions, which is further drives the overall industry. The global digital signage market growth is accredited to the increasing demand for digital promotion of products and services to attract the attention of the target audience in an effective manner. The evolution of innovative products such as home monitoring systems, leak detector systems, and more, are the factors predicted to drive demand in the global digital signage market. Moreover, there is a rising demand for adopting advanced products that require digitized information management and guidance that can be accessed from remote locations. This is one of the key drivers anticipated to boost the global digital signage market. Digital signage offers the necessary quality information to a large number of viewers by utilizing large display screens across the location with a concentrated target audience. With digitized display technology, information is provided in a digitized format that includes motion and pictures in order to attract customers with more impact as compared to the traditional modes of reaching out to customers. This could propel growth in the global digital signage market. The factors such as software and hardware compatibility, networking, electrical interface, and connectivity are the few prevailing issues likely to hinder the market’s smooth growth. Moreover, the complex taxations levied upon erecting digital signage and screens, coupled with the regulatory processes such as licensing are projected to hamper the market growth. Eventually, the growing awareness among the consumers regarding the drawbacks and complexity of traditional advertising such as short-lived print marketing is instigating the digitized advertisement adoption. Additionally, the innovative efforts led by the display designers, researchers, and advertisement companies are spending more on the improvement of the digital signage display technology. As such, all these factors are in turn, expected to catalyze the overall industry growth. Our reports are single-point solutions for businesses to grow, evolve, and mature. Our real-time data collection methods along with ability to track more than one million high growth niche products are aligned with your aims. The detailed and proprietary statistical models used by our analysts offer insights for making right decision in the shortest span of time. For organizations that require specific but comprehensive information, we offer customized solutions through ad hoc reports. These requests are delivered with the perfect combination of right sense of fact-oriented problem solving methodologies and leveraging existing data repositories.